Swimming is a popular way to get fit and healthy because of its relative safety but the pressures of competitive swimming introduce new elements of risk. Competitive swimming involves swimmers competing to be the fastest to swim a given distance. 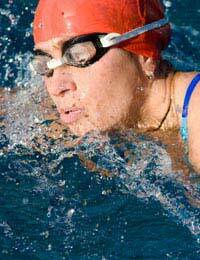 The four competitive strokes are butterfly, backstroke, breaststroke and freestyle. Swimmers tend to choose to swim the front crawl in a freestyle race because it is typically the fastest stroke. Swimming is much celebrated activity not only because it is great exercise for the body but it enjoys a low risk of injury compared with most sports. However, although simple water workouts are comparatively safe, the more competitive and higher level the swim, the greater the pressures put on the body and the greater the risks of injury. The greatest risks faced by competitive swimming are overuse injuries, particularly in the shoulder but also the knee, foot and ankle, and the back. Although a swimming pool environment is a relatively safe environment for competent swimmers, the greatest risks of competitive swimming are a result of the pressures the swimmers put on themselves, by pushing themselves too hard performing the same exercises. Those swimmers who specialise in the butterfly stroke put themselves at greater risk of developing back and shoulder pain after long periods of intensive training. Breaststroke swimmers are more susceptible to knee and hip pain, whereas freestyle and backstroke swimmers are at risk of developing the familiar and dreaded tendonitis shoulder injury known amongst athletes as ‘swimmer’s shoulder’. Cross training is when an athlete diversifies their training programme by including different sporting disciplines. For instance a swimmer might train for a competition by cycling and running as well as by swimming. This method means the whole body gets a more balanced work out and there is less focus on certain muscle groups, and thereby less risk of injury. Injuries may, for example, result when one muscle group becomes stronger than an opposing group, and cross training reduces the chance of such imbalance. Also even if a swimmer does sustain an injury, cross training allows them to maintain their aerobic fitness by exercising unaffected muscles with alternative exercise. Cross training is also a great way to relieve the tedium of repetitive exercise. The best way to safely prepare for swimming competitions is to get professional training or supervision. This will provide essential instruction on correct breathing management, including exercises that expand CO2 tolerance and mental strength. Instruction should also include such aspects as how to effectively apply correct posture to swimming technique based on personal body type, and how to control and use perfect water balance for smoother and faster swimming. Always remember to take time out to warm up and stretch before any kind of work out. Research has proven that cold muscles are more susceptible to injury. Do not swim when too tired, too cold or overheated. Be prepared for any emergency situations and make sure that medical personnel are easily accessible.